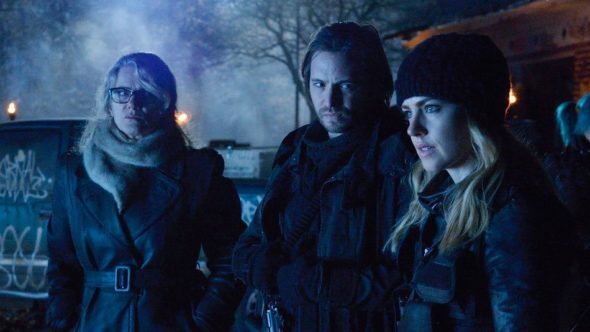 Although Syfy has already renewed its 12 Monkeys TV show for a fourth and final season, we’re still tracking the season three ratings, because even renewals can be cancelled. Between the first and second seasons, its numbers in the 18-49 demo fell by 53% and the show lost 49% of its total audience. Meanwhile, the cable network is trying something new in season three. Perhaps in an attempt to inspire streaming-style binge watching, it will air all 10 episodes over three consecutive nights. Will this help boost viewership or have they decided the numbers no longer matter for this show? Stay tuned. A sci-fi mystery, 12 Monkeys stars Aaron Stanford, Amanda Schull, Kirk Acevedo, Todd Stashwick, Emily Hampshire, and Barbara Sukowa. The drama series follows the journey of James Cole (Stanford), a man from 2043, who is sent back in time to stop the evil Army of the 12 Monkeys from destroying the world. Christopher Lloyd guest stars in the third season as charismatic cult leader Zalmon Shaw, with Hannah Waddingham, Faran Tahir, and James Callis recurring. For comparisons: The second season of 12 Monkeys averaged a 0.12 rating in the 18-49 year old viewer demographic and a total audience of 402,000 viewers. What do you think? Do you like the 12 Monkeys TV series? Do you think it should be cancelled or renewed beyond its fourth season? I think show ratings are not correct or even close, so many great shows have dismal ratings. If i know dozens of people who watch certain shows regularly in the small area where i live its it seems nationwide it should be in the millions. Anyway 12 monkeys is a great show. I missed the entire season because of this boneheaded move with ZERO repeats …. Are we supposed to cancel our plans just because some Idiot Corporate Suit thinks he has an idea? The ratings for the binge a thon were just as pathetic as I said they would be. I said they would go below a 0.10, and I was RIGHT! Now you all know why SYFY gave it a season four before showing season three; it was because they knew the ratings would be disgusting. They might even have been lower if they had showed it week to week. Syfy is completely nuts! My DVR didn’t record several shows of the previous season so I thought Syfy would replay them prior to the new season… they didn’t. Now I have the current season in my DVR and am not sure if I should just give up on this show at this point. Showing all the episodes like this assumes everybody is unemployed and can just spend a couple of days binge watching a show. I long for the days of Stargate: SG1! They binged it like that because they knew the week to week ratings(if it was shown that way) would go below a 0.10 live ratings average(which it did anyway). There will be a season four, so watch season 3 when you want to. The binge-a-thon was a new idea to try. Since most people(but not me) have DVR’s, SYFY thought they might get more people to watch. They might do this again with an extremely low rated show, so don’t be shocked when you see it.